Today I ate some latkes. They were pret ty standard potato latkes. They weren’t made by anyone that I knew particularly well, and they were delicious. Obviously, my mom’s are still the best but I am entirely biased. On this, the 3rd night of Chanukah I have two questions, dear reader. 1. Applesauce or sour cream? 2. 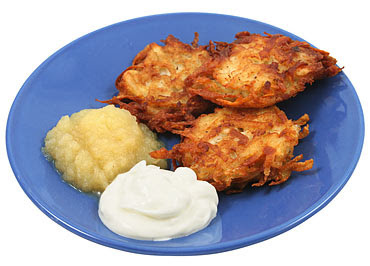 What do you think of the new twists on latkes? Sweet potato additions and such? My answers will appear tomorrow for night #4. 1. combination of the two. 1. I’m actually a fan of mixing the applesauce and sour cream together. 2. Rachel and I made a traditional/sweet potato mix on Friday. Delicious. Just got finished reading through your daily blogs. What a great idea!!! And, as would be expected, blended with some “fun” stuff are your reminders of the need to eradicate injustice wherever it might be. I will keep reading your blogs and know that I will be enriched by them. And, just for the record, applesauce is my topping of choice. 1. Neither – I add salt to soak up the oil when they are hot and someone got me to try maple syrup on cold latkes as a kid. 2. Sweet Potato????? My kids would disown me!!! My question would be to those that stand there for hours and make them, how many do you actually eat after that? 1. I personally mix the two together! But of course it depends on Milkich or fleshig. Then of course if it is fleshig only the applesauce. 2. I love all the variations –zuchini and spinach especially. Not big on the carrot latkes tho’! And then the question becomes, why the variation on the spelling of milk and meat in Yiddish? so….growing up i was a cinnamon and sugar kind of girl. weird i know. but as of late i like mixing the sour cream and applesauce – a perfect combination. as for the new varieties – big fan! we’re making our own for shabbat and i plan to mix up sweet potato, zuchini and regular. after reading some of your other comments i’m thinking spinach too!